The students those who have finished their Higher Secondary examination are waiting for the 12th class result 2015. The Tamil Nadu Board of Secondary Education was announced the HSC result for State board, Metric and CBSE on 7th May 2015. The TN Board of Secondary Education announced the state first, second, third place students name / marks / total, the toppers list, subject wise toppers list, first three places in each subject, district wise toppers list / merit list, school wise toppers list, name of the students those who have scored centum, first three places in state board, metric, CBSE and first mark in Mathematics-, Physics, Chemistry, Biology, Botany, Zoology, Computer Science, Accounts, Commerce, Tamil, English, Hindi, Sanskrit and vocational group subjects will be announced on 07-05-2015. The students are now waiting for the mark sheet and for the Transfer Certificate (TC) which is much important for them to join in Higher studies like Engineering, Medical, Arts and Science colleges. But the marksheet will be issued after one month. Here we have enclosed the details about the Marksheet issuing date, how to get the marksheet both in online and in offline, TC issuing date and details about the Employment office registration. Tamilnadu HSC marksheet issue date? Tamilnadu 12th Marksheet issue date will be declared soon. It will be issued within 3 weeks. Where you have to collect your class 12th mark list? The students can collect their class 12th marksheet from their school where they have studied or can download the HSC mark sheet online. The candidates can collect their TC from their school on the same date, when they are issuing the marksheet in the school itself. 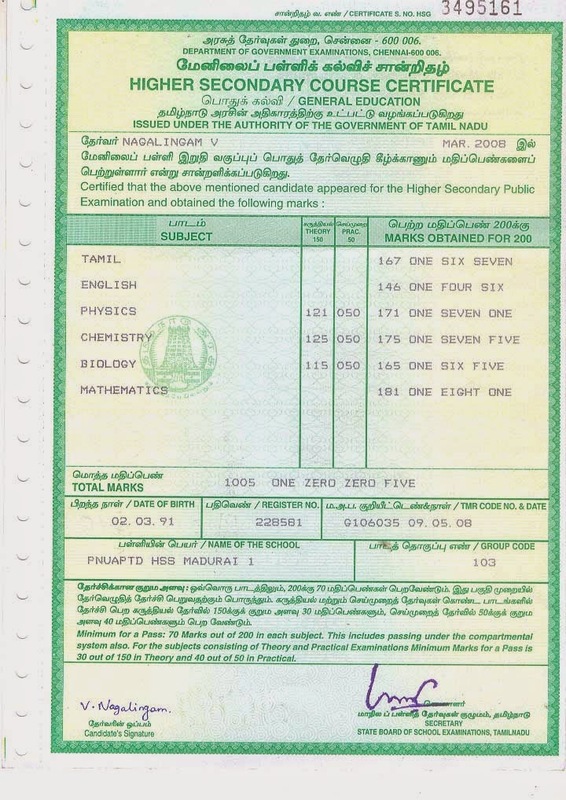 How to download Tamilnadu HSC marksheet? The students those who have passed in the Higher Secondary Examination can download their marksheet from the official website of the, tnresults.nic.in. Using original marksheet for applying for the higher studies is highly at risk, so instead of using original marksheet you can download the marksheet and use when it is needed. Even you can use these print out if there any delay on issuing the 12th marksheet in your school or district even in case your 12th marksheet lost. The downloaded marksheet of copy is useful for getting loan on 12th marksheet from bank. How to register on employment office? After getting your mark list from your school you have to register on employment office by using your Tamil Nadu HSC mark list and Transfer Certificate issued by your school. Now most of the schools are providing the employment registration for 10th and 12th students in their school itself. But you can also register in your own native district and directly on the employment office. The Employment registration will be very useful for getting job opportunities in government sectors. Kindly, register on this website to know further details about Engineering, Medical, Arts and Science colleges list, cutoff requirements college wise, counselling schedule, list of top colleges in Tamil Nadu.